The Nigerian President, Mr. Mohammed Buhari has signed the Not Too Young To Run Bill to law. This follows his promises on the democracy day to sign the bill in fews days time. The bill became law Thursday afternoon in a signing ceremony witnesssed by a group of young people from Nigeria’s 36 states and the FCT. President Buhari signed the bill to law at Council Chambers of the Presidential Villa, Abuja. 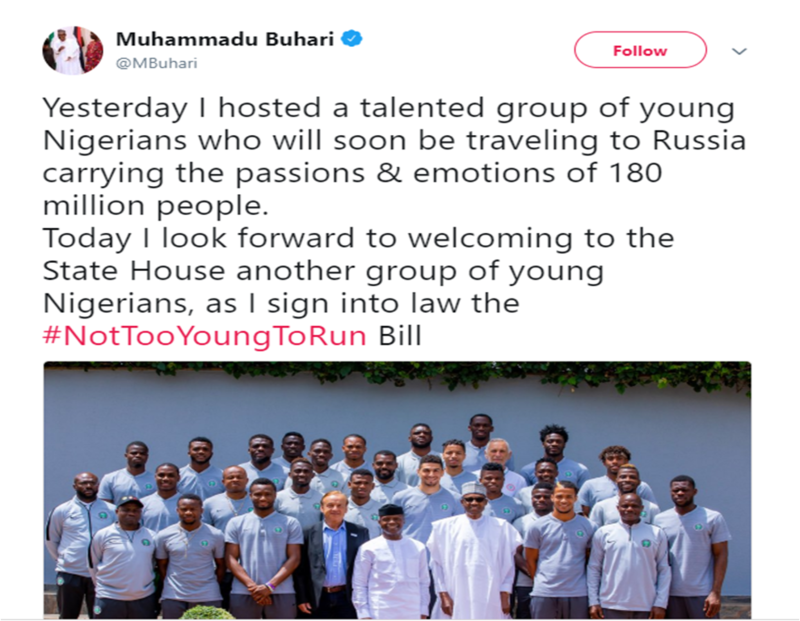 Earlier in the day, President Buhari tweeted that he looks forward to welcoming to the State House a group of young Nigerians, as he signs into law the #NotTooYoungToRun Bill. Not To Young To Run Bill was passed at the National Assembly July 2017 and sponsored by Hon. Tony Nwulu. The Bill alters the Section 65, 106, 131, 177 of the 1999 Nigerian Constitution. It reduces the age requirement for the office of the President from 40 years to 30, Governor from 35 to 30, Senate from 35 to 30, House of Representatives and the State House of Assembly from 30 to 25. Meanwhile, many young Nigerians took to their social media network in reaction to this development. Not Too Young To Run is a global campaign launched in 2016 by the United Nations in partnership with the UN Secretary General’s Envoy on Youth, the UN Development Programme (UNDP), the Office of the High Commissioner for Human Rights (OHCHR), the Inter-Parliamentary Union (IPU), the European Youth Forum (EYF) and the Youth Initiative for Advocacy Growth & Advancement (YIAGA) to Promote the Rights of Young People To Run for Public Office. The campaign seeks to address the age limitations in running for the elected government offices. It believes that the majority of the world’s population are people under age 30 and 73% of the countries have denied these category of people the opportunity to run for elected offices because of age factor. If such people have the right to vote for their leaders they should also have the right to contest in elections, hence the slogan: If you’re old enough to vote, you’re old enough to run for office. 73% of countries restrict young people from running for houses of parliament, even when they can vote. Nigeria is the first and only country that have passed this bill into Law.